The tightening UK system capacity margin manifested itself last Wednesday in a period of magnified system stress and spiking power prices. The issues related to a specific set of circumstances, but these were by no means an extreme event. The more enduring impact is likely to come from the media attention that is set to increase the UK government’s focus on security of supply. The tightening UK system capacity margin has been a theme of this blog over the last 4 years. This manifested itself last Wednesday in a period of magnified system stress and spiking power prices. The system operator, National Grid, took a number of defensive actions, paying up to 2500 £/MWh in the balancing mechanism to bring capacity online and ensure continuity of supply. The issues last Wednesday related to a specific set of circumstances, but these were by no means an extreme event. High demand was not the issue. Several thermal asset outages combined with reduced interconnector flows and very low wind levels to cause the capacity squeeze. System stress eased as capacity came back online with little impact on forward prices. But Wednesday’s events are an indication of more to follow as the system capacity margin continues to tighten over the next two winters. The more enduring impact of this event is likely to come from the news headlines it attracted. It is this unwelcome media attention that is set to increase the UK government’s focus on security of supply, particularly as more plant closures loom in 2016. 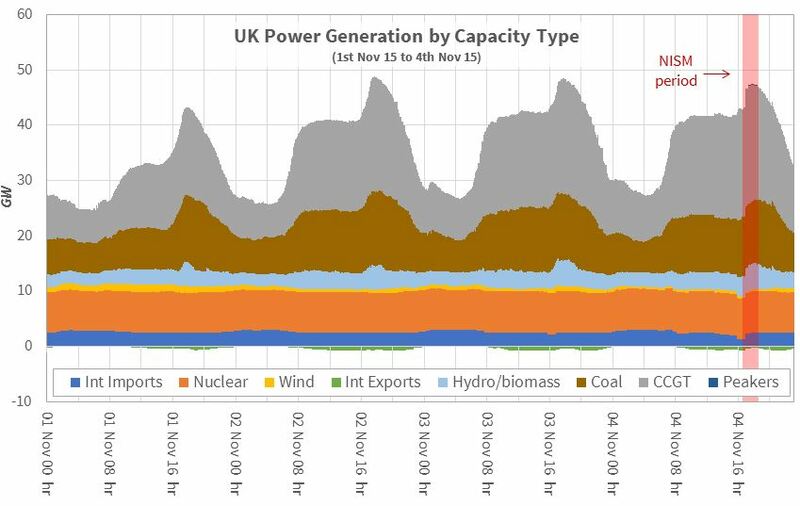 Chart 1 illustrates UK generation output on Wednesday in the context of the three proceeding days. Demand conditions were relatively benign, with peak demand lower than Monday or Tuesday. Wind levels were low across last week, but particularly low on Wednesday (with output falling to less than 1% of potential). The impact of coal unit outages and a reduction in French interconnector flows can also be seen. The combination of these events was unusual but not extreme. But the market price impact was magnified by the UK’s low system capacity margin. National Grid issued a Notification of Inadequate System Margin (NISM) at 13.30, a fairly rare event (the last being in 2012). The NISM called for an additional 500 MW of capacity across the 16:30-18:30 period. Grid then took a number of balancing and reserve actions to address the shortfall, including procuring capacity at up to 2500 £/MWh in the balancing mechanism. It also resorted to the ‘last resort’ use of 40 MW Demand Side Balancing Reserve contracts across the 18:00-18:30 period (a mechanism we explain in more detail below). The prices last Wednesday can be seen in the context of adjacent days in Chart 2. The red and blue lines show the balancing mechanism system sell and system buy prices respectively. There are indications of some system stress via balancing prices on the two preceding days (given low wind levels and thermal outages). But the balancing price shock became much more pronounced on Wednesday as Grid took more aggressive actions to procure capacity. 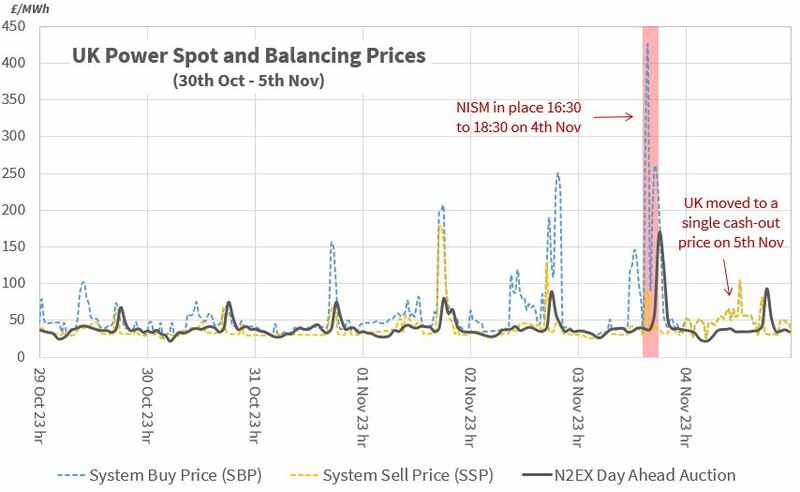 This in turn fed through into higher day-ahead power prices (in the N2EX auction) on Wednesday, shown by the black line. However the temporary nature of this event can be seen as conditions reverted back to more normal levels on Thursday. Chart 2 also shows the UK balancing mechanism transitioning from a dual to a single cashout price from 5th November. This one of a number of measures being implemented over the next couple of years under the supervision of Ofgem to ensure sharper balancing price signals in the UK power market. The events of last week are empirical evidence of a tightening system capacity margin causing higher and more volatile prompt prices. This is exactly the sort of situation that we foreshadowed in the final sentence of our article UK capacity new build challenges two weeks ago. Grid has contracted 2.5 GW of reserve capacity under these mechanisms for the coming winter (2015/16). This volume is dominated by SBR (less than 200 MW of it is DSBR), which is provided by aging power plants. A total of 8 plants have been contracted to provide SBR, all of them on the ‘endangered species’ and hunting for any form of return to contribute to fixed cost recovery. This buffer of SBR/DSBR reserve capacity has become the key tool to manage the UK capacity crunch. From a security of supply perspective SBR acts to reduce the risk of blackouts. It is therefore included in Grid’s calculations of system reserve margin, which is almost zero without it. But because SBR can only be called as a last resort, it does not prevent sharp rises in prompt power and balancing prices during periods of system stress. Events such as last Wednesday are evidence of this in action, but only a prequel to a much tighter market as capacity continues to close in 2016. The UK capacity market is yet to deliver a price signal that covers the fixed costs of existing CCGT capacity (let alone the delivery of new capacity). That shifts the focus of plant owners & investors on to the energy and balancing markets. But investment decisions are not made based on volatile balancing prices alone. A recovery in forward market generation margins (sparkspreads) is required to stem the tide of plant closures and encourage new investment. And as the system capacity margin continues to tighten, it is only a matter of time until the UK forward curve starts to reflect higher returns in the prompt market.